The club can supply all you need for your training course but it is nice to have your own kit and you do need to factor in the cost of buying a few items if you decide to continue fencing. Prices can range from £20 for a glove to £100 for a top end electric foil (but you don’t need top end…) with jackets £55 and masks around £80. Plus any P&P as most suppliers are on line or some way out of town. 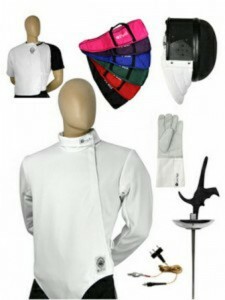 The advantage of the Club is that you can build up your own items as budget allows and use Club kit in the meantime. For discount and to minimise P&P buy through the club and also see our Equipment for Sale page. Always ask for advice from the club before buying and beware buying from auction sites and the cheaper suppliers. British Fencing has barred certain kit from certain suppliers and changes to regulations has made some older clothing obsolete. Regulations are also different for younger age groups. You are strongly advised to ask for advice from the Club before making a purchase and try out the different foil grips at the club before deciding what suits you. Have a look at these popular suppliers and/or ask for a quote from the Club Armourer (see contact page). Discounts apply when ordered through the club.